All Initial Evaluations are conducted in the Eden Prairie office. 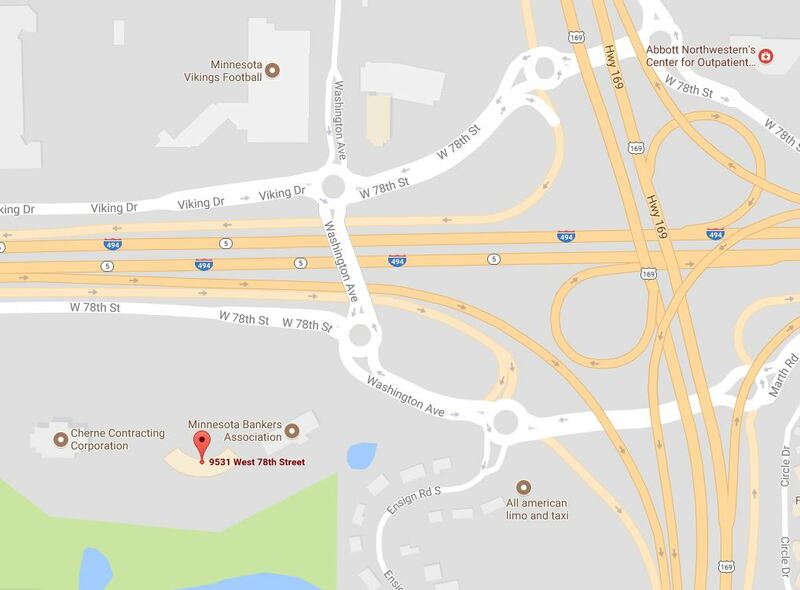 We are located on the southwest corner of 494 and 169 in the Cabriole Center office building. When using GPS for directions, it is best to type in “Cabriole Center” for most accurate directions. Take exit 11A – Priaire Center Drive/Flying Cloud Drive. Stay to the right and get off on Prairie Center Drive. Turn left at the stop light onto Prairie Center Drive (far left lane). Turn left at the next stop light onto West 78th Street. Continue 1 mile and turn right into the Cabriole Center (if you have reached the traffic circle you have gone too far). Take exit 12 – Valley View Road. Take a left at the stop light onto Valley View Road, continue on for 1 mile. Turn left at stoplight on to West 78th Street. Continue 1 mile and turn right into the Cabriole Center (if you have reached the traffic circle you have gone too far). Take the exit for Valley View Road. Take a left at the stop light onto Valley View Road/Prairie Center Drive, continue straight through first stop light. Turn left at the second stoplight on to West 78th Street. Continue 1 mile and turn right into the Cabriole Center (if you have reached the traffic circle you have gone too far). Take the Washington Ave/Marth Road exit. Enter the traffic circle, remain in the left lane and continue west on Marth Road. Enter the next traffic circle and continue straight (left lane) on to Washington Ave. Enter the final traffic circle, take the second exit onto West 78th Street. Our building will be the first left once on West 78th Street, look for the Cabriole Center sign. Take the West 78th Street Exit, stay in the right lane. Turn right onto West 78th Street. Get in the left lane, enter the next traffic circle, take third exit onto Washington Ave (going over 494). Get in the right lane and turn right immediately at the next traffic circle onto West 78th Street. Our building will be the first left once on West 78th Street, look for the Cabriole Center sign. This is a therapy only location, all Evaluations are conducted in our Eden Prairie office. 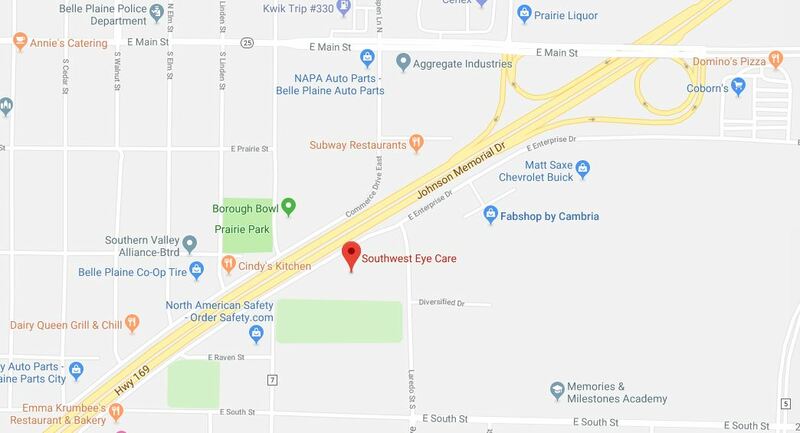 We are located inside Southwest Eye Care just off of 169 in Belle Plaine. From 169, turn right onto S Meridian Street. Turn left at the first cross street onto E Enterprise Drive and follow for about 1 mile. Southwest Eye Care will be in a strip mall on your right. From 169, take the exit towards MN-25/County Rd 64/County Rd 3, follow this exit into a sharp right and then turn right at the stop light, Hickory Blvd. Turn right onto E Enterprise Drive and follow for about 1 mile. Southwest Eye Care will be in a strip mall on your left.